Children with hearing loss must have a medical evaluation by a licensed physician before being fitted with hearing aids. 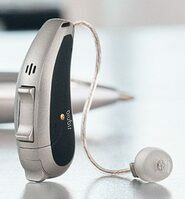 Hearing aids are battery powered, electronic devices with microphones that amplify sound in the ear. 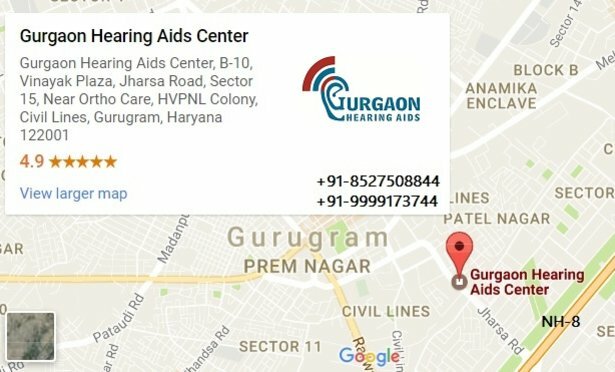 With technological advances, many hearing aids today can be programmed to respond differently to individual sounds and amplify them according to the unique nature of a child’s hearing loss. A child’s hearing instrument needs to meet the age-specific and ever-changing needs of a child. These are best addressed by digital instruments that are specifically designed for active children and teens. May be recommended for adolescents, depending on their hearing impairment, needs and preferences. Not recommended for infants and young children because their amplification does not cover profound hearing loss, they do not allow much ventilation or open fittings, and are not compatible with FM systems used in schools. A Hearing Care Professional can help you and your child select the most appropriate hearing instrument. 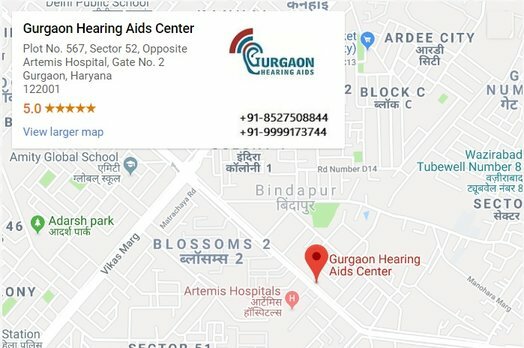 He or she will schedule a fitting, which consists of ordering and producing earmolds, as well as fine tuning the instrument settings to your child’s ears and hearing needs. Growing up is exciting business – each moment presents different challenges, every day is full of fun, learning and meeting new friends. 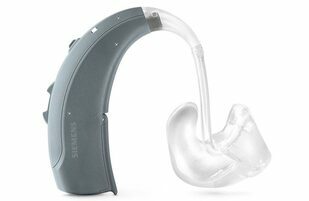 Siemens hearing solutions for babies, children and young adults help them meet these challenges and discover everything life has to offer. We develop our personalities and begin to create our own style as young adults – and it’s important that hearing instruments match that identity. Pure a is tiny and ultra-discreet RIC (Receiver-In-Canal) hearing instrument so that others hardly notice it. But it’s still fully equipped and packed with high tech functions: It’s rechargeable and can be controlled wirelessly by using the miniTek™. The miniTek can also be used to transform Pure into a set of high performance stereo headphones, streaming audio content from phones, MP3 players, stereos or TVs straight into the hearing instrument. Motion SX is a discreet hearing instrument that won’t attract attention right away, but it also has the same level of wearing comfort that many are used to from previous traditional Behind-The-Ear hearing instrument experience. It’s small, fits everyone, and is especially easy to handle using the onboard controls. Plus, it’s jam-packed with the latest technology and many practical functions: It’s rechargeable, eliminating the need to fiddle around with batteries. And with Bluetooth® wirless technology, Motion SX can wirelessly connect to phones and MP3 players. These hearing solutions keep kids connected so they never miss a thing. They are excellent devices for babies thanks to child-safe key locks and baby-safe battery doors – Motion M and P can be worn safely and comfortably, helping them discover the world and build the foundation for language. Direct audio input works with a digital FM system to send the teacher’s voice directly to their ear. Lessons can be heard as clearly as if the teacher were standing directly in front of the child – even when they sit at their favorite spot at the back of the classroom or by the window. Then it’s almost as if the good grades happen by themselves. 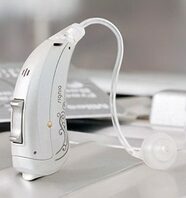 Motion M and P also have a slim-neck design, ensuring that the hearing instrument fits comfortably behind the ear. Growing up means connecting to people. Same as a good friend, you can rely on your hearing instruments wherever you are. Focusing on the sounds you want to hear, Nitro is a super power instrument with strong amplification so you won’t miss a note of your favorite tunes or the latest gossip your friends want to share with you. Nitro’s feedback canceller avoids annoying whistling, so you get every detail of any secret whispered into your ear. And Nitro has the power to connect, so that you can use a remote control with your instruments or stream audio from TVs and smartphones. Whatever life has in store for you, Nitro is your powerful partner. Here are a few tips on how to handle your child’s hearing aids. Over time and with practice, you’ll find that these things will become second nature to you and your child. All of our devices for children are easy to insert and extremely comfortable to wear. Take the earmold between your thumb and index finger and insert the earmold into the ear. Gently work the earmold into its proper position by adjusting it until it is firmly seated in the ear. Then, lift the hearing instrument over the top of the ear and adjust it to fit behind the ear. When removing the hearing instrument, push lightly on the back of the ear to help release the earmold, and gently pull the hearing instrument from the ear. Because each child’s ear grows at a different rate, it is important to look for signs that the child is outgrowing the earmold. “Acoustic feedback” (a high-pitched squealing sound emanating from the hearing instrument) occurs when amplified sound escapes from the ear and is picked up by the microphone again. This is a good indication that the earmold no longer fits properly, and that a new earmold is needed. Understand your child’s need to participate in various activities. Let him or her know that it’s OK to run, play and engage in sports activities with everyone else. But educate your child regarding the aspects of everyday life that can affect hearing instruments – moisture, dust and perspiration, for example. With just a little attention to these details, you’re less likely to encounter problems that can affect the long-term performance of the instruments. It is also important to pay attention to the average life of your child’s hearing instrument batteries, in particular with a younger child. Your child may not be able to tell you when the batteries are empty. A stethoset can be used by parents or careres to perform a listening check of the hearing instruments. It looks like a stethoscope which is normally utilized by a doctor. To use it, connect the hook of the hearing instrument to the tube of the stethoset. Then, put the stethoset into your ears and speak. You should be able to hear your voice through the earpieces. If you detect a crackling noise or other unnatural sound, it may indicate a problem. If so, take the instrument to your Hearing Care Professional for evaluation and possible repair. Excess moisture is one of the most common causes of poor hearing instrument performance. You should periodically check the earmolds, tubes and hooks for signs of moisture, dirt or dust. Excess earwax (cerumen) in the earmold can also affect the instrument’s performance. Your Hearing Care Professional will show you and your child the procedures for checking and cleaning the hearing instruments, using a soft tissue or cloth. Today, most hearing instruments operate with zinc-air batteries, which have a “+” and “-” pole like other batteries. New zinc air batteries are activated by removing the small tab covering them. Insert the new batteries into the hearing instrument(s) as instructed by your Hearing Care Professional. Use a battery tester to check the status of the batteries regularly. Assuming that your child is old enough, engage your child in the process of learning how to care for his or her instruments.